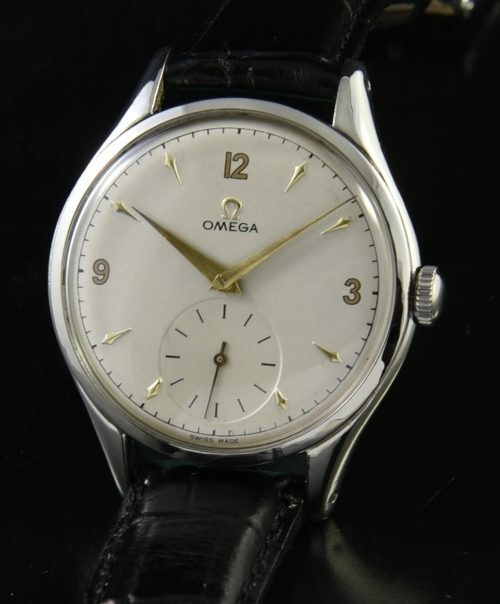 This is an uncommon and wonderfully LARGE OMEGA dating to 1948 and measuring 38mm. This sprawling steel watch has a perfectly restored dial maintaining the original gold toned markers and Dauphine hands with sub-seconds. The crowns and crystals were not signed and were generic in this era. The manual winding caliber 265 movement was just cleaned-accurate. These 200 series movements were the reliable workhorse engines that ticked away reliably through WW2. These LARGER size watches are becoming harder to find. You will love it.